Systemic arterial blood pressure is created by the pumping action of the heart, circulating arterial blood volume, and smooth muscle tone of blood vessel walls. Arterial blood pressure is essential for adequate perfusion of tissues, providing oxygen delivery for energy demands. The ability to measure and monitor blood pressure trends provides important data about patient cardiovascular status and may help define approach to treatment. Know when to alert the clinician who is managing the patient. Part 1 of this article series discusses terms associated with blood pressure measurement, indications for measurement, and normal and abnormal blood pressure values. Part 2 will describe types of blood pressure monitors and provide step-by-step instructions on how to perform blood pressure measurement. Indirect arterial blood pressure monitoring relies on detection of arterial blood flow or vessel wall movement in a peripheral artery, using Doppler or oscillometric methods (Figures 2 and 3). FIGURE 2. Doppler blood pressure measurement. FIGURE 3. Feline patient connected to an oscillometric blood pressure monitor. Veterinary nurses should think critically about results obtained in their patients, never looking at 1 value independent of the rest of the patient. If the patient is hypertensive, is it also tachycardic? Is the patient in pain, anxious, or both? Is the patient’s hypertension a result of being restrained to obtain a blood pressure reading? If the patient is hypotensive, is it also tachycardic or bradycardic? How responsive is the patient? Is it dull or stuporous? These are the types of questions that veterinary nurses should ask. By taking time to consider the “whole picture” rather than only looking at isolated pieces of information, veterinary nurses are better able to process what may be happening with their patients and pass significant concerns on to clinicians. Blood pressure measurement provides important information about the cardiovascular status of a patient, and the importance of knowing normal values in different species cannot be overstated (Table 1). Hypotension is defined as lower than normal blood pressure. Hypotension results in decreased tissue perfusion and can result in compromised blood flow to vital organs. 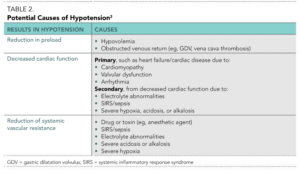 Common causes of hypotension are listed in Table 2. A diagnosis of hypotension is made based on the patient’s presentation, physical examination, and blood pressure measurement. A hypotensive blood pressure reading should be followed by brief physical assessment of the patient, and the clinician should be notified of the patient’s status. Hypotensive patients should be monitored on a regular basis and their cardiovascular status should be re-evaluated, at minimum, every 30 minutes. Frequent reassessment is necessary to determine whether therapy is working or if more aggressive intervention is necessary. It is important to remember that a patient’s cardiovascular status can decline rapidly. Renal tissue perfusion diminishes when MAP declines below approximately 65 mm Hg.4 In patients with sustained MAP < 65 mm Hg, the patient’s urine output should be monitored closely because decreased urine output can signify impaired renal perfusion. Hypertension is typically divided into 2 categories: primary and secondary. 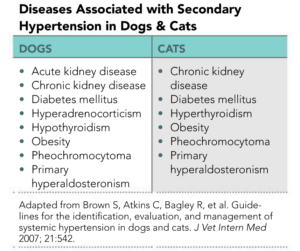 Primary hypertension is caused by an imbalance between cardiac output and systemic vascular resistance that has no known cause; therefore, it is sometimes referred to as idiopathic hypertension.6,7 It is rare in small animals. Cats: SAP > 150 mm Hg. It is imperative that severely hypertensive patients are treated at a facility that can provide 24-hour critical care monitoring. As part of this homeostatic mechanism, the initial response of the body to compensate for decreased MAP is to bring it back up to normal by increasing systemic vascular resistance, by vasoconstriction. Vasoconstriction, in turn, can diminish blood flow to peripheral tissues, resulting in decreased tissue perfusion despite the patient remaining normotensive. 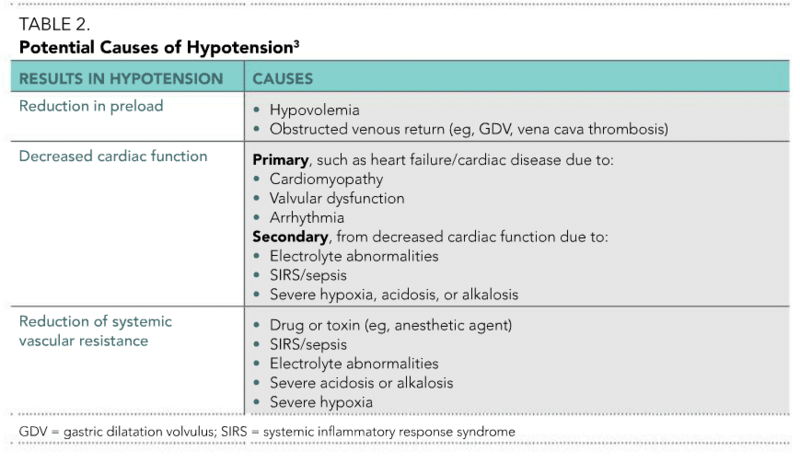 Often, the patient does not become hypotensive until the compensatory mechanisms have failed. Heart rate should always be recorded at the time of blood pressure measurement; presence of tachycardia in association with hypertension should prompt consideration of white coat hypertension. Provide a safe, quiet, comfortable environment and slowly introduce yourself, allowing the pet to feel at ease and build a sense of trust. Consider taking the pet into a quiet room, attempting to make the cage/carrier more comfortable, using a box as a retreat sanctuary for a cat, or engaging in gentle play using a dog’s favorite toy. If you are successful and can measure blood pressure, take 3 readings to obtain an average; then consider repeating the process later when the pet is more relaxed. Some patients may fall into the category of white coat syndrome, which should not be confused with true hypertension. Unfamiliar faces, scents, and sounds, followed by a close encounter with a stranger in a white coat can inadvertently cause stress, anxiety, and fear, hindering our ability to obtain accurate blood pressure readings. 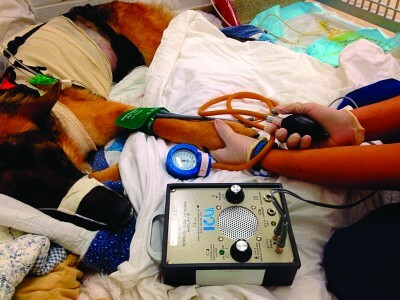 Veterinary nurses play a fundamental role in patient care. We are often on the front lines, assessing patients as they are initially presented and then assessing them repeatedly after the clinician leaves. This gives us unique insight to detect subtle variations that may otherwise go unnoticed. 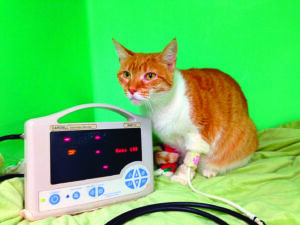 Documenting that information, interpreting it, and communicating changes to the clinician provides the veterinary team an opportunity to proactively manage potential problems. Grimm KA, Tranquilli WJ, Lamont LA. Essentials of Small Animal Anesthesia and Analgesia, 2nd ed. Ames, IA: John Wiley and Sons, Inc, 2011, p 208. Waddell LS, Brown J. Hemodynamic monitoring. 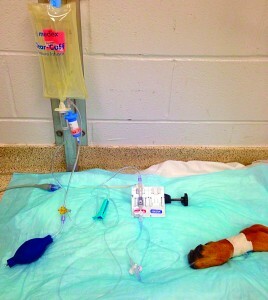 In Silverstein DC, Hopper K (eds): Small Animal Critical Care Medicine, 2nd ed. St. Louis: Elsevier, 2015, pp 957-962. Williamson JA, Leone S. Noninvasive arterial blood pressure monitoring. 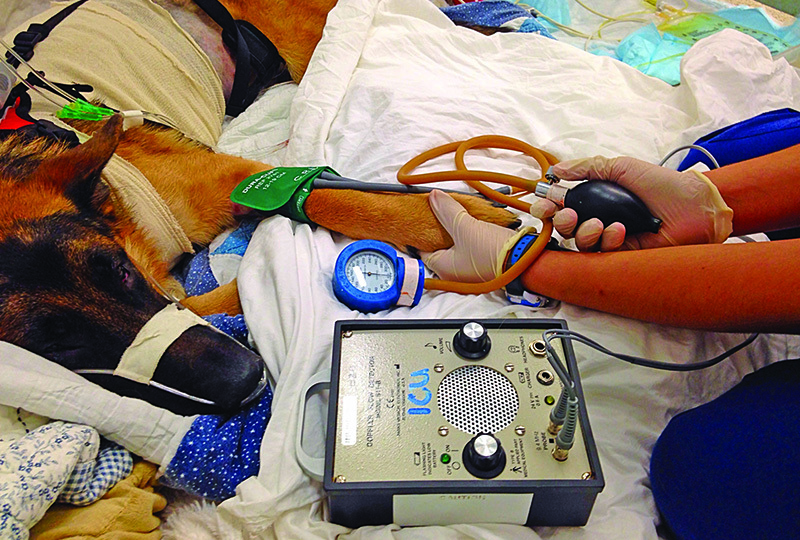 In Burkitt Creedon JM, Davis H (eds): Advanced Monitoring and Procedures for Small Animal Emergency and Critical Care. Ames, IA: Wiley-Blackwell, 2012, pp 134-144. Brown S, Atkins C, Bagley R, et al. 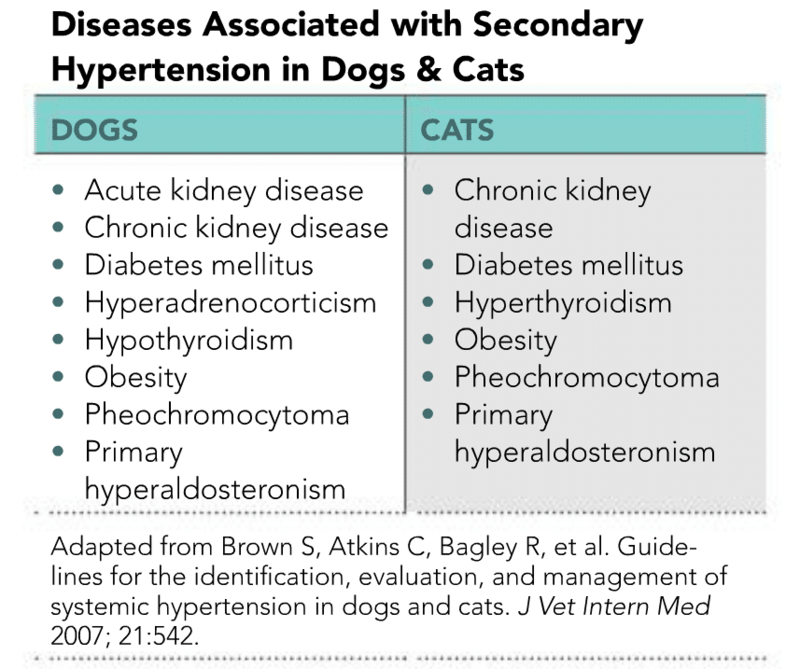 Guideline for the identification, evaluation, and management of systemic hypertension in dogs and cats. J Vet Intern Med 2007; 21:542. Labato MA. Antihypertensives. 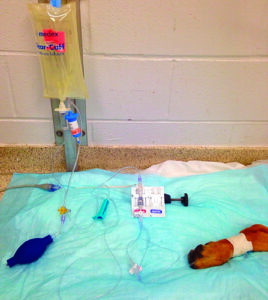 In Silverstein DC, Hopper K (eds): Small Animal Critical Care Medicine, 2nd ed. St. Louis: Elsevier, 2015, pp 840-845. Oaklander M. Do you have high blood pressure or are you a victim of white coat syndrome? Prevention 2014; available at prevention.com/health/healthy-living/your-doctors-raising-your-blood-pressure. Lila K. Sierra, CVT, VTS (Emergency and Critical Care) is the assistant nursing supervisor of the intensive care unit at Matthew J. Ryan Veterinary Hospital of University of Pennsylvania. She has lectured at state conferences and has published chapters in various veterinary manuals. Her passion lies in all aspects of advanced nursing care, including patient advocacy, innovative nursing development, and education of prospective veterinarians and nurses. Emily Savino, BA, CVT, VTS (Emergency and Critical Care) is the nursing supervisor of the intensive care unit at Matthew J. Ryan Veterinary Hospital of University of Pennsylvania. 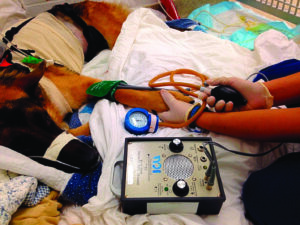 She has lectured on veterinary critical care nursing at conferences, and has published chapters in veterinary texts. She enjoys teaching new veterinary nurses the art of “critical thinking” and working in an environment where she is learning new things every day.